AVALON – The Catalina Island Conservancy was created in 1972 to conserve the land as well as to provide education and recreation. In 2009, a 32.7-mile Trans-Catalina trail was made available. On Oct. 14, Catalina Island Conservancy celebrated the launch of Trekking Catalina. Trekking Catalina is the expansion of new hiking trails on the island. The Catalina Island Conservancy gave credit to Los Angeles County Supervisor Don Knabe for his many contributions to the conservancy and the island. Knabe and his staff have provided funding for numerous projects, including a $1.5 million Proposition A (Los Angeles County Regional Parks and Open Space) grant for Trekking Catalina. Trekking Catalina will provide 26.7 miles of newly developed hiking trails on the island. It will minimize the impact on the land by upgrading and consolidating “social trails,” which are unofficial trails created by wildlife and the foot traffic of campers and other users over time. The conservancy also will install sustainable restrooms that will meet the need for clean and odor-free facilities to improve the hiking experience and help to protect the environment. In addition, the Conservancy will install new signage to make it easier for hikers to find their way around the Island. Some of the trail expansion work will be performed by the Conservation Corps of Long Beach (CCLB) to fulfill Prop. A youth employment goals. Avalon youth, through CCLB’s participation, will also have opportunities to work on the trail project so they can gain work experience in construction and conservation. 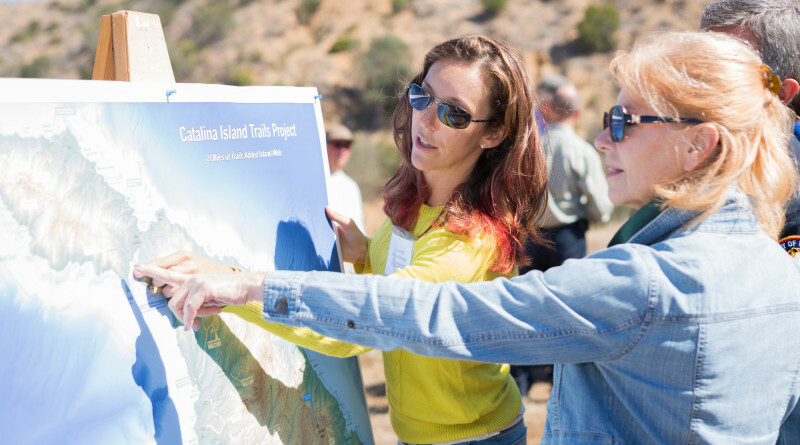 The groundbreaking for Trekking Catalina is another major milestone in IMAGINE CATALINA, the conservancy’s long-range strategic vision and master plan. The groundbreaking comes just four months after the conservancy began construction of its new visitors’ center, The Trailhead, in Avalon.